Growing out of the ancient and mammoth cliffs of the Changbai Mountains, a mountain range that lies on the border between China and North Korea, are Eastern White Cedars – better known as “Trees of Life”. Historically, they are considered to have profound medicinal value, especially for treatments found in TCM (Traditional Chinese Medicine). In this capacity these special trees are known under yet another name. For simplicity’s sake this is the one we will refer to it by for the rest of this text. It is, “Mountain Thuja” (or “MT”). Technically, Mountain Thuja is a genus of coniferous trees in the cypress family. 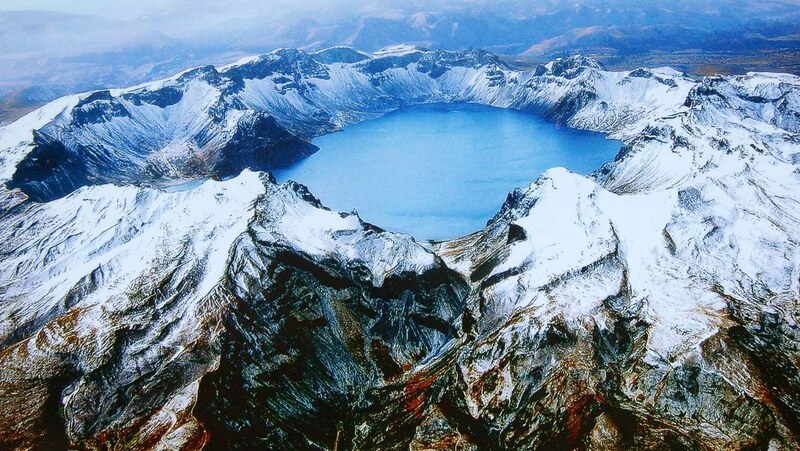 There are only five species attributed to it, two native to North America while the other three may only be found in eastern Asia, such as the aforementioned Changbai region from which the roots are extracted (a direct translation of “Chungbai” is “a perpetually-white mountain region characterized by long and cold winters”). Not to be confused with other types of the more abundant Thuja, MT is the ONLY one that is actually harvested from the cliffs of the Changbai, a mystical area shrouded in fog and believed to possess ethereal vitalizing qualities in its air and soil. MT trees are unique, a species that has become extremely rare and sought after. Properties derived from the wood have long been desired for the practice of TCM, providing relief against, or even curing an array of, illnesses and conditions. Everything from warts to gout, malaria to scurvy, or even strep throat to rheumatism has been treated by the therapeutic material. It has even been engineered to induce labor. And it hasn’t been overlooked by modern medicine. Elements from the tree have been used in treating two illnesses of the greatest concern: cancer and HIV. Some consider MT to be of supernatural origin. In examining such beliefs, it is interesting to learn that the “magical” quality of the Cedar may be traced to the Latin terms through which it is linked. 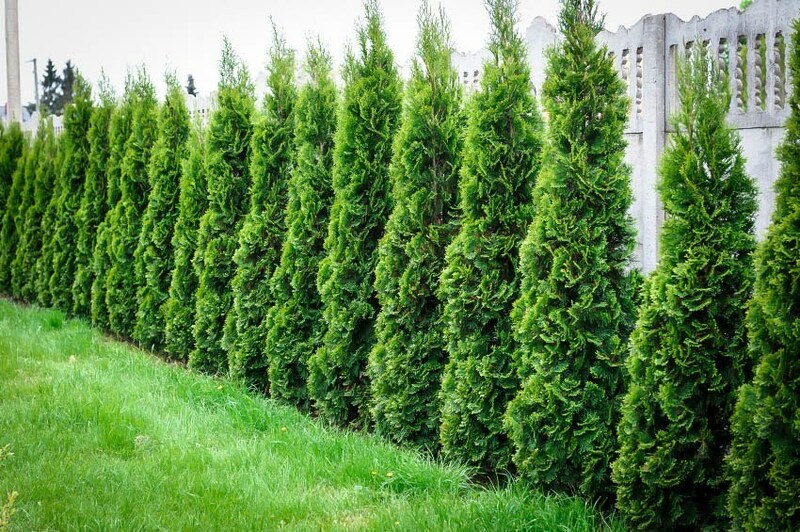 Thuja is derived from the ancient Greek words Thuya, which means “to sacrifice”, and thusia (a burnt offering). Given the nature of the ancient native uses of cedar as a smudge for protection and conscience-clearing, there is a connection. To further understand the enchanted aspects of the tree, look at some of its homeopathic uses. It is alleged to help people who struggle with coping and depression. Excessive behaviors such as drug addiction or overeating are treated and sufferers are provided a way to reconnect with their spirituality. It is also applied homeopathically for those with low self-esteem or shame due to their own adverse behavior or trauma inflicted upon them. It renews and “clears” them of the demons that are disruptive. It is further purported to penetrate the subconscious and connect us all deeply, rather than superficially. But ultimately it is warned that it must be used properly and in the right doses – perhaps another indication of its powerful qualities. Now, imagine having a beautiful work of art carved from MT. The wood has a strong and calming aroma (seriously, there is something refreshingly potent about that first whiff), so such a piece engages a number of senses remarkably. 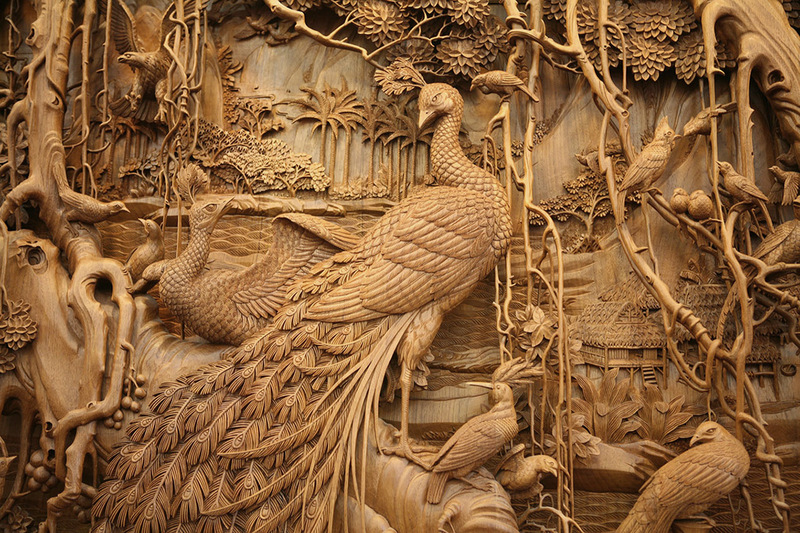 Without question, Chinese wood carving is appreciated and renowned globally for the art form’s impressively detailed compositions. They evoke a vivid perception of three dimensions as well as the beauty of the subjects that can range anywhere from folklore, nature, religious and social motifs, landscapes or beyond. Today, traditional woodcarvings are highly desirable and in-demand, wanted for display in private galleries or by collectors, or even casually as elegant residence decor. Truly intricate in their craftsmanship, after they have been sawed, clipped and polished, an exceptionally beautiful and one-of-a-kind art object emerges, making the most effective use of MT’s original shape and natural beauty. Of equal value, its healing abilities are not lost in this form. It is still a rare species of wood lending itself to the health of the senses and the body. Besides putting us at ease with its pleasing visual aesthetic, it is aromatherapy of sorts. 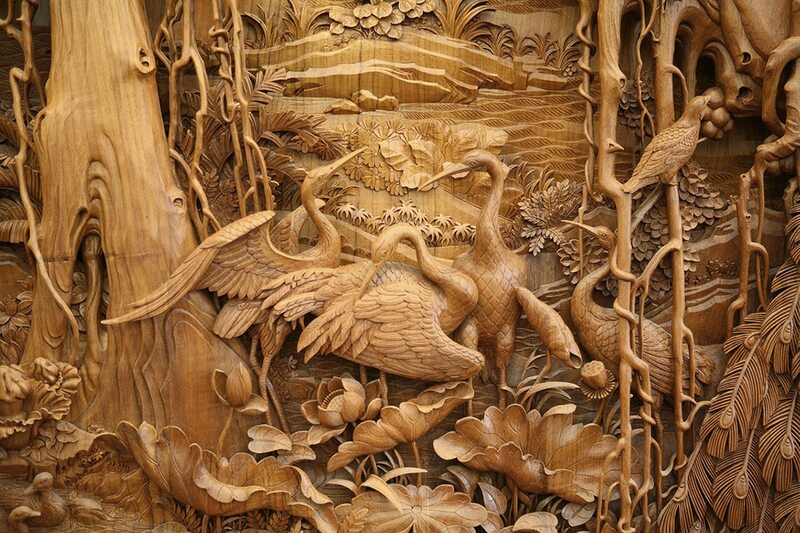 The healing properties of Mountain Thuja carvings emit from the wood while serving to beautify the space and appear as impressive high-end works of art. Certainly, they make great additions to any home, adding touches of elegance, good health and spirituality.